Tired of the same old experiences that can be found in hotels or on campsites? Perhaps you’d prefer to stay in a portable plastic offering from Bubble Tree. You too could be a bubble boy or girl with one of these unusual huts. 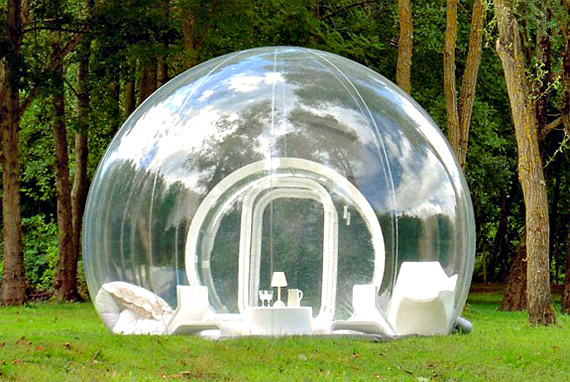 The french designed, GlampingBubble Tree (glamping=glam camping) has two basic types of bubbles to choose from. The BubbleRoom has a translucent bottom half that provides bubble dwellers with a modicum of privacy. The CristalBubble is entirely see through. The floor of the CristalBubble is transparent too (if you don’t install the optional wood floor), so you can place one at a beach edge and watch waves lap beneath you. The bubbles manage to hold its shape thanks to an electric turbine that keeps the structure optimally inflated. The blower is silent and runs the air through a filter that supposedly removes all bugs, moisture and allergens. That fresh air, along with the bubble’s ultraviolet-proof plastic, helps moderate temperatures and keeps the greenhouse effect in check. This glamping experience is also equipped with a hefty price. A CristalBubble with a removable wood floor, air turbine and carry case will set you back about $12,000. Though handful of unusual camping grounds around France have bubbles you in which you can spend the night.